Small talk is the polite (sometimes dreadfully awkward) conversation usually shared between people who are strangers or mere acquaintances. Though it may sound simple enough, it’s not as easy to pull off as one would think, with some people claiming that there is a special “art” to it. But whether you’re fond of it or not, small talk is a fact of life—just like taxes or public transport that go on strike. When you’re in public places or in a social situation such as parties or a wedding reception, small talk is (a) necessary (evil). Small talk also comes handy in breaking the ice during important life events like before your big job interview or that important networking event you need to join…or when the person whom you’re convinced is *the* love of your life is standing beside you in the buffet area. But wait—what if you’re in France or in any other French-speaking area? How can you navigate small talk *and* speaking French at the same time??? 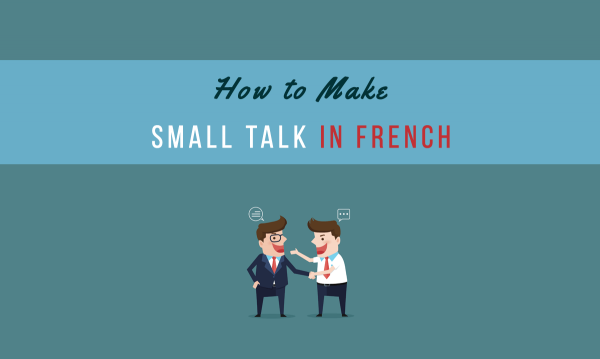 Unfortunately, mastering small talk in French is not as easy as thinking what to say and blurting it out. But with this guide, you should be able to pick up ideas on how to become better at small talk—or at least, no longer dread it. Be nice. A minimum requirement is that you just have to be nice. Start by stating obvious comments. Like how long the line is, how interesting the table arrangements are or what you think about the music. Do a bit of research. It doesn’t hurt to do a bit of reading about useful topics beforehand. Show interest. \Show how interested you are in the conversation, listen intently, and ask appropriate open-ended questions. Don’t feign expertise. Be honest on what you know and what you don’t. Throw in a casual (non-creepy) compliment every now and then into the conversation. Just remember to do it in moderation when you’re speaking to French people because the French are not really that big on compliments. Know when to exit a conversation. If the person you’re trying to engage in a chat is not as responsive (or way too responsive for your taste), learn how to make a clean getaway. Excuse yourself properly. If you need to master French small talk for business purposes, you can also check out this article about French business culture. Some topics which are considered normal or common in other cultures can be considered as taboo in France. For example, other nationalities would find it acceptable to ask people they just met questions like if they’re married, what they do for a living, if they have kids—or in some cases, how much they make in a year. In France, that is never a topic for small talk. Conversation gurus might tell you about the FORM technique—a strategy used to master the art of small talk (F=Family, O=Occupation, R-Recreation, M=Money). Trust me, you need to throw this out the window when you’re speaking with French people. Instead, focus on innocuous topics like the weather (of course! ), current events (“avez-vous lu à propos de..?” Have you read about…? ), and cultural topics like food, movies, art, music, and so on. And remember to use vous instead of tu! To learn more about taboos in French conversations as well as other faux pas, check out this guide. Introductions are a different lesson on itself and needs plenty of examples. But you can learn how to introduce yourself properly in French and how to say basic greetings with this complete lesson on Basic French Greetings. It comes with audio lessons to help you with the pronunciation, too! Here is a list of phrases you can use and practice when giving and asking for personal information. Take note that the list makes use of the formal “vous”. Comment vous appelez-vous? What is your name? Je m'appelle Christine. My name is Christine. Quel est votre nom? What is your name? Comment allez-vous? How are you? Je vais bien, merci. I am doing well, thank you. Très bien, merci. Very well, thank you. Quel âge avez-vous? How old are you? J'ai # ans. I am # years old. J'ai trente ans. I am thirty years old. J'ai quarante-deux ans. I am forty two old. Quelle est votre nationalité? What is your Nationality? Je suis canadien(ne). I am Canadian. Je suis brésilien(ne). I am Brazilian. Je suis américaine. I am American. Je suis vénézuélien(ne). I am Venezuelan. Je suis chinois(e). I am Chinese. Je suis coréen(ne). I am Korean. Où habitez-vous? Where do you live? J'habite à Sao Paulo. I live in Sao Paulo. J'habite en Californie I live in California. Quel est votre numéro de téléphone? What is your phone number? Mon numéro de téléphone est le 123-456-7890 My phone number is 123-456-7890. Où êtes-vous né(e)? Where were you born? Êtes-vous marié(e)? Are you married? Est-ce que vous avez des frères et soeurs? Do you have any brothers and sisters? J'ai - frère(s) I have - brother(s). J'ai - soeur(s.) I have - sisters(s). Je n'ai pas de frères. I don't have any brothers. Je n'ai pas de soeurs. I don't have any sisters. Quel est votre métier? What is your job? Quelle est votre profession? What is your profession? Que faites-vous dans la vie? What do you do for a living? Je suis ingénieur. I am an engineer. Je suis boulanger/boulangère. I am a baker. Je suis médecin. I am a doctor. Je suis infirmier/infirmière. I am a nurse. Now let’s proceed with personal interests. Once you have gotten the basic personal information questions out of the way, it’s always nice to discuss personal interests a little bit. Here are some words and phrases you can use with that. For this part, we have added the informal “tu” forms of the phrases considering that at this point of your chat, you might already be on first-name basis with your conversation partner (just in case). J'aime faire du sport et garder la forme. I like to do sports to keep fit. Non, Je n'ai pas un animal de compagnie. No, I don't have a pet. Oui, J'ai un chat. Yes, I have a cat. Oui, J'ai un chien. Yes, I have a dog. Qu'est-ce que vous aimez? What do you like? J'aime le jazz. I like jazz. J'aime le rock. I like rock. J'aime le hip-hop. I like hip-hop. Je n'aime pas le rap. I don't like rap. Je n'écoute pas de la musique trés souvent. I don't listen to music very often. J'aime les films d'amour. I like romance films. J'aime les films d'adventures. I like adventure films. Je n'aime pas le ski. I don't like skiing. Qu'est-ce que vous aimeriez faire dans la vie? What would you like to do in life ? J'aimerais être chef. I would like to be a chef. J'aimerais être un bibliothécaire. I would like to be a librarian. J'aimerais être un avocat. I would like to be a lawyer. Did you know that here in Talk in French, we have plenty of good resources to help you master conversational French? 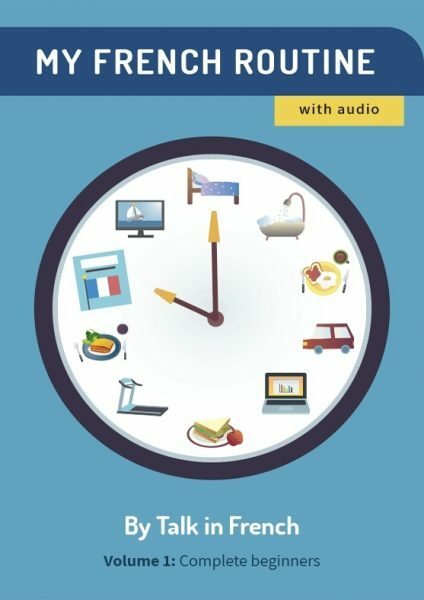 Whether you are a super newbie or you have previous background in French, the series of e-books called My French Routine is packed with listening exercises, grammar, vocabulary, and quizzes to help you speak French. It is divided into 20 days of lessons per volume, with review sessions every weekend—truly, it’s an effective way to learn French. Check out the first volume here , the second one here, the 3rd volume here. See the rest at the Talk in French Store. Did you like this guide? Don’t forget to leave a comment on what other guide you’d like us to cover next! 🙂 Merci! Previous Post 15 French Expressions that Feature Dogs Next Post [QUIZ] Can you guess what these goat-related French expressions mean?